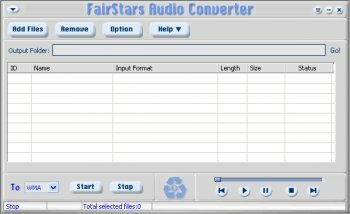 FairStars Audio Converter is a media file conversion tool to convert WAV, RealMedia (RM, RA, RAM, RMJ, RMVB), AIF, AIFF, AIFC, AU, Creative VOC, PVF, PAF, SVX, IFF, APE, FLAC, OGG, VQF, MP1, MP2, MP3, MP4, M4A, M4B, AAC, WMA, WMV, ASF to WMA, MP3, AAC, VQF, OGG, FLAC, APE, WAV formats. You can convert multiple files in a single batch, regardless of their source and target formats. In addition, the program includes a built-in player. Works great, but this is a trial version which limits your conversion to under 180 seconds (3 mins), otherwise you have to purchase a license.